Yes. I am interning at the Mecklenburg County District Attorney’s Office. Yes, I am working in criminal prosecution. Yes, I interned at the Guilford County District Attorney’s Office. 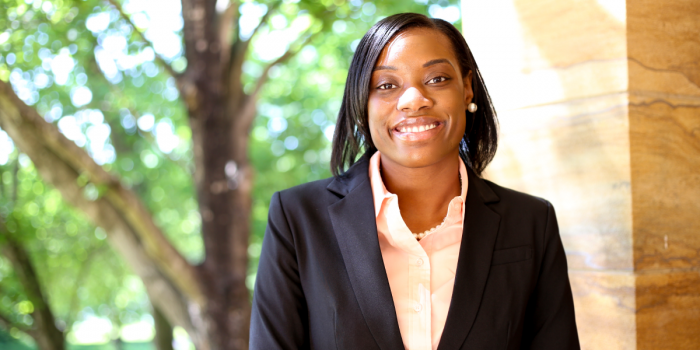 I decided to attend Wake Forest Law, because I felt that the professors truly wanted to see me succeed and would provide the support that I needed to be successful. I also really loved the clinics that were offered. Describe the Wake Forest Law community. The Wake Forest Law community is like a huge support system that is committed to the success of its law students. Everywhere you turn there is someone who will help you and point you in the right direction to be successful. My most memorable experience is attending the Black Law Students Annual Welcome Dinner at the beginning of my 1L year. It was an amazing experience to see most of the professors of color and students of color at Wake Forest Law come together to encourage you to be successful and to provide a support network. So far I have participated in the Wake Forest Innocence and Justice Clinic. I have also participated in the Pro Bono Project’s Know Your Rights, Expungements, Teen Court, and Prison Letters projects. I am also the vice president of the American Constitution Society, a research assistant in the Worrell Professional Center Library, and a fellow with the Wake Forest Criminal Justice Program. I am interested in entering a career in criminal prosecution. I also have a interest in working in a compliance role.